For the latest Green Energy Technologies news, please join our newsletter mailing list. Please add newsletters@getsmartenergy.com to your address book to ensure delivery. 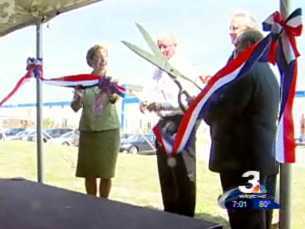 Caption: Ribbon cutting with (left to right) Congresswoman Marcy Kaptur, Hal Hawk from Crown Battery, Mark Cironi from Green Energy Technologies, and Jim McKinney from Lake Erie Business Park. 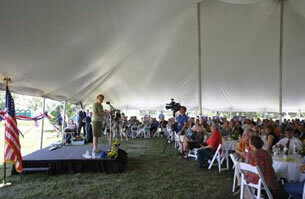 Caption: Congresswoman Marcy Kaptur giving a wind energy speech at the ceremony. The WindCube Prototype is featured in the second edition of Wind Turbine Technology by Dr. David Spera. You will need a PDF Reader to view these PDFs. You can download Adobe Reader for free here.